With a big budget live action production set to be released in just a few weeks, the beneficial timing of this animated Green Lantern adventure certainly doesn't go unnoticed. That being said, 'Green Lantern: Emerald Knights' is thankfully much more than a mere movie tie in cash grab. Based on the DC Comics characters, and brought to the screen by many of the current creators behind its source material, this original animated film is both lovingly written and visually exciting. Following the mythos established in the comic, the film focuses on an intergalactic police force that call themselves Green Lanterns. With representatives from species spanning the universe, each Lantern wields a supercharged green ring that is fueled by will power itself, allowing its wearer to construct whatever weapon or tool his mind commands. The main star of the comic and the upcoming live action adaptation is Earth's leading Green Lantern, Hal Jordan. Though a part of this animated production, the filmmakers have decided to go in a slightly surprising but not unwelcomed direction, instead skewing the focus to some more obscure members of the Green Lantern canon (Jordan himself was also already covered in the previously released 'Green Lantern: First Flight' ). The story is essentially an anthology of shorts that feature flashbacks to several characters' backgrounds. Branching these disconnected plots together, is a present day tale that focuses on a rookie female Lantern. Hal Jordan and others narrate the separate stories to her, serving to transition us to the different episodes which then all lead to an exciting climax in the present. Being episodic in nature, some of the stories do tend to be stronger than others, but as a whole they all work remarkably well. Highlights include a look at the origin of the Green Lantern Corps itself, a fun boot camp training adventure with an alien Lantern named Kilowog, and a particularly creative story based on an Alan Moore penned issue of the comic. Even the weaker plots have their moments and there's just something wonderfully captivating about the core of the idea. Most of the characters featured were all once reluctant heroes, as the powers they wield were not their own choice. The ring actually picked them, and this aspect of destiny plays powerfully, creating strong moments where the characters finally rise up to the potential that was seen in them. Though simple and certainly not groundbreaking, each segment plays like an action packed parable with a cosmic twist, illuminating what it means to be a hero. Considering the limited time we have to spend with each story, I was surprised by how much I came to care about the characters and how much I became invested in their tales. Led by 'Firefly' star Nathan Fillion, the cast also includes other notable talent such as 'Mad Men' actress Elisabeth Moss. As expected, the performances are all very strong and each actor brings a distinct and fairly well rounded personality to their characters. The animation style itself is also rather fantastic. Featuring a streamlined but not overly simple approach, character designs resemble a combination of broad American comic book sensibilities and a slightly anime influence. Some subtle use of CG is also present and tends to blend well with the 2D material. Motion is nice and fluid and there are many visually exciting effects and action sequences included throughout that bring an absolutely epic air to the proceedings. Though mostly successful, there are a few shortcomings to be found. Some of the transitions to the various stories can be a bit jarring and unimaginative and again not every episode is a winner. Also, the main plot which serves as a framing device is mostly unengaging, though it does find its footing in the film's explosive climax. 'Green Lantern: Emerald Knights' is an entertaining and well written adaptation of the Green Lantern mythology. While some might be turned off by the episodic approach, this animated adventure is full of simple but still strong storytelling that should appeal to both young and older viewers alike. Fans of the comic should be pleased by the respectful treatment and those new to the Green Lantern world might want to check this out as a primer for the upcoming Hollywood feature. 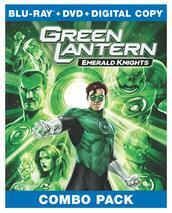 Warner Premiere has provided 'Green Lantern: Emerald Knights' in a Blu-ray/DVD combo pack. Housed in a standard case with a cardboard slipcover, the BD-50 Blu-ray disc sits alongside a DVD that includes a digital copy. The film is presented with a 1080p/AVC transfer in the 1.78:1 aspect ratio and the results are rather good with only some minor technical flaws. Detail is nice and sharp but somewhat limited by the sleek style of the animation chosen. Colors are wonderfully rich and vibrant and constantly pop off the screen. Contrast is great and black levels are nice and inky. On the downside, some very minor aliasing is faintly visible in a scene or two. Of a bit more concern, however, is some banding evident throughout. While clearly visible at times and certainly not ideal, I didn't find it to detract much from the presentation. Even with some minor technical faults, the video transfer is strong and the final climax of the movie is a great display of the animation's strengths, showcasing some cool effects and detail work as an army of Lanterns square off against a giant threat. 'Green Lantern: Emerald Knights' is provided with an English DTS-HD Master Audio 5.1 track along with French, German, and Italian Dolby Digital 5.1 tracks and Spanish and Castilian Dolby Digital 2.0 tracks, with several subtitle options including English SDH, French and Spanish. Like the video, the audio work is well done. Dialogue is clean and full and the sound effects are all creative and varied, bouncing around the soundscape with a sharp and pleasing fidelity. Directionality is lively and exciting with some decent surround usage that creates a suitably immersive experience. Dynamic range is strong though not terribly wide and bass does have some welcomed kick in the numerous action sequences. Balance between all the elements is well handled never sacrificing speech for explosions. While not as powerful or intricate as its big budget live action peers, the soundtrack here is very solid. Sneak Peak at Batman: Year One (HD, 11 min) - This is a behind the scenes look at DC Animation's latest project, an adaptation of Frank Miller's celebrated take on Batman's origin. Though no actual finished animation is shown, we are treated to some character designs, storyboards, and interviews with the filmmakers and cast, which includes Bryan Cranston, Eliza Dushku, and Katee Sackhoff. Considering the source material and the talent involved, this is definitely a project to look out for. Sneak Peak at All-Star Superman (HD, 11 min) - Presented in 1080i, this is a similar look at the already released 'All-Star Superman' animated feature. Panels from the comic, storyboards, and interviews with the filmmakers and cast are included. Trailers - Two useless trailers for a DCU Application and Matty Collector. 'Green Lantern: Emerald Knights' is a wonderful collection of cosmic parables that demonstrate what it really means to be a hero. The video and audio are both strong and supplements are pretty good. Those looking for a good introduction to these characters before the live action blockbuster hits screens, should definitely consider giving this a rent. Fans should be happy. Recommended.